You wanna learn how to add a magnetic snap to your bag or purse? Not a problem! 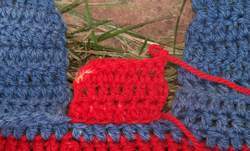 Here, you will find FREE and EASY instructions with pictures for adding this designer-esque closure to you hand made project. The first time I saw a magnetic snap at my local craft store I was so excited. The thought of being able to add such a quality fastener to my bag made me so happy that I actually purchased THREE that day! Nope, I didn't know how to use them or how to add them but I knew I could figure it out. It wasn't long before I created the perfect purse to add this wonderful snap. 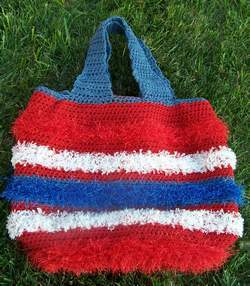 I called it the Patriot Purse. I took pictures of how I added what I call the snap flap and the snap fastener to the purse. When do I use a magnetic snap? 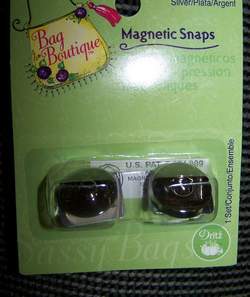 When you are working on a bag or purse that needs a somewhat invisible closure or that simple yet elegant finishing touch to lift the design...this is when you use a magnetic snap. It is very easy and quick to add to any project. Go that extra step past a button and add a snap fastener! 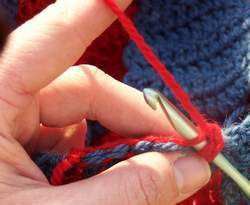 NOTE: The following instructions are given for adding a snap to a crochet purse but they are easily converted to knit or sewing. 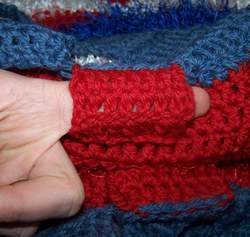 Instead of creating the snap flap out of crochet simply follow the same technique and use knit or sewn fabric. *CH 2 and turn; HDC into first hdc and in each across*. 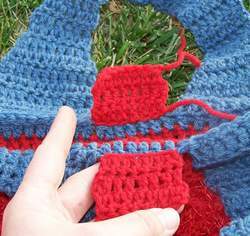 Repeat from * for a total of 4-6 rows (depends on how thick you want the snap flap to be), on last row finish off. Repeat steps 1 and 2 on the other side of your purse making sure that they line up as this snap flap is where you will be placing the magnetic snap so you want to make sure they are placed evenly on both sides! Now, you need to sew the snap flap down to the inside of the purse. ONLY ON THE BOTTOM OF THE SNAP FLAP leaving the sides open. 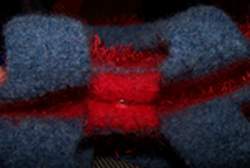 NOTE: At this point on the example I felted the purse before I added the magnetic fastener. 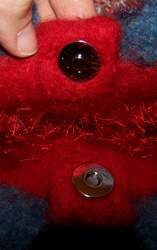 If you are not felting the purse you can still follow the instructions continued below. Remove the magnetic snaps from their package and make sure all the parts are there. The package should include two round snaps with prongs on the back of them and two rectangle pieces, which fit on the prongs. Take one snap and push the prongs through the snap flap you created. 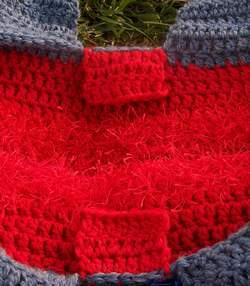 NOTE: If you felted your bag it is important to add the fasteners while the bag is still damp. Use your finger and go between the snap flap and the purse and make sure the prongs are only through the snap flap and NOT the purse. Now, take the rectangle piece and put it between the snap flap and the purse. 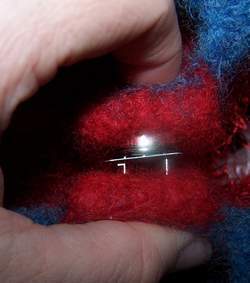 Again, using your finger, feel your way and place the rectangle piece over the prongs on the back side of the snap flap. Then, like a manilla folder, flatten or fold the prongs down to either side thus making it flush with the purse. You have finished adding one snap fastener! NOTE:It is important that you add the other side of the snap in the correct place so your purse will close properly. To make sure the snap fasteners are aligned, I like to connect the remaining snap to the snap I just attached. From here, I will line up the empty snap flap to the exposed prongs of the snap I just connected with the already attached snap. Just like before, use your finger and go between the snap flap and the purse and make sure the prongs are only through the snap flap and NOT the purse. Now, take the rectangle piece and put it between the snap flap and the purse. 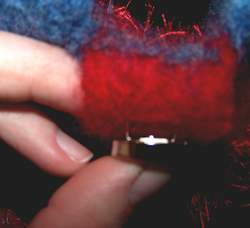 Again, using your finger, feel your way and place the rectangle piece over the prongs on the back side of the snap flap. Then, like a manilla folder, flatten or fold the prongs down to either side thus making it flush with the purse. Voila, you have accomplished adding a magnetic snap fastener! Little Tip: The bigger you make the snap flap the more room you will have to work with your fingers to fold the prongs down. 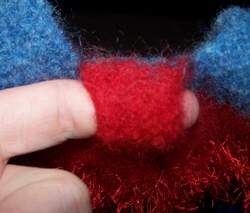 Also, be sure that if you are felting the purse, you felt it first then add the snaps when the purse is still damp. This will allow you to easily push the prongs through the snap flap. Otherwise, it is more difficult to do. 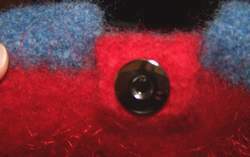 Now that you know how to add a magnetic snap you are ready to learn how to add a button.